A few months ago, I decided to complete my application for a Nexus pass, the Canadian version of the Trusted Traveler Program. Now, the Canadian and U.S. border protection services have vetted me, and I can travel across the U.S./Canada border more quickly. On the U.S. side, this is called Global Entry, and also qualifies you for TSA PreCheck. Of all the changes I’ve made to my travel habits, this has been by far the most significant improvement. Here are the reasons I’m so glad I got it. With Nexus, going through security is such a breeze now. Most airports have a designated lane for Nexus pass holders, especially if you are going through a security checkpoint in Canada for gates with flights going to the United States. If you are traveling within the U.S., Nexus includes TSA PreCheck. Unfortunately, a lot more people have TSA PreCheck in the U.S., so the line isn’t always that much shorter. My experience in Canada has been super fast, however. I like to cut it close with my flights. Not to the point where I’m at risk of missing them, but I prefer to be efficient and usually leave just enough time to fill my water bottle, grab a coffee, and visit the bathroom before boarding a flight. For that reason, anything that speeds up my time going through security is a bonus. For more tips on skipping the line, read my interview with a digital nomad. One of the worst things is getting stuck in a customs line after flying for hours on end. Even when I’m traveling home to Canada, I’m usually so eager to get to my house, waiting in line to declare my purchases seems like a waste of time. With Nexus, whether you clear customs on your way out of a Canada or the U.S. or when you land, you have a special lane with biometric kiosks that take your fingerprints and a retinal scan. A faster customs lane has been particularly helpful for me when I’m clearing customs during a connection because that’s the last place you want to get held up. Typically, when crossing a border during an airport connection, you have to clear customs and go through security again. These connections sometimes require you to wait in a special room for their agents to scan and process your checked bags before they allow you to continue. When I’m traveling with a carry-on, I can waltz through the customs area, bypassing all these steps. Nexus pass holders don’t have to jump through as many hoops while going through security. However, the benefits are more than just saving time. I like that I don’t have to take off my shoes, my coat, or remove all my electronics from my bag. In the winter, it can be cumbersome to remove all my gear, shuffle it through the scanner, and put it back on again. With Nexus, I can usually skip some of that, including the full body scan. Keep in mind that not all airports offer “full Nexus” at all times of the day. Smaller airports or certain checkpoints may not offer any perks. Nexus is a privilege, not a right. For a list of airports with Nexus/Global Entry services, click here. Remember when you had to fill out a customs card on the plane before you landed? No more! While most places have been phasing them out anyway in favour of machines, Nexus cardholders have their very own set of kiosks to complete these questionnaires and no longer require you to fill out a card. 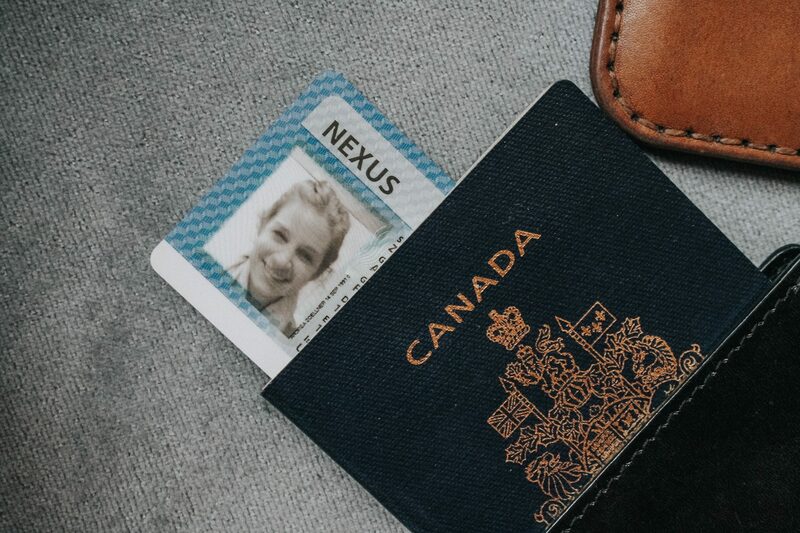 Nexus pass holders can also use their Nexus card instead of their passport. Having a smaller ID has come in handy for me at the airport, where I find it more convenient to carry a card and my boarding pass on my phone, which are small and light. Even when I’m out and about in the U.S., I like having a Nexus pass because it serves as a Government-issued ID for Americans who can’t read my French-Canadian ID cards. Now, this is anecdotal, but in my experience, the airport staff members are more courteous to Nexus pass holders. You are also in the same line as the airline staff, so you feel like you’re “part of the club”. The first time I used a Nexus lane, the TSA agent offered to take my coat and lay it in a bin and held my bins for me while I removed my laptop. Such service! Canadian citizens and permanent residents can apply to Nexus while U.S. citizens and residents should apply for Global Entry. They are both a part of the Trusted Traveler Program (TTP), just different sides of the coin. A few other countries can apply to this program, see the list here. As a Canadian, I can tell you the application process was very easy. First, I filled out an application on the TTP website, listing the places I’ve lived and worked in the past five years. I later got an invitation to a meeting at the airport where I answered a few questions about what I did for a living and why I needed the Nexus pass. After that, the agents took my fingerprints and a scan of my eyes. I was approved, and ten days later, my card arrived. The application cost me CAD 50 and is valid for five years. The TTP program also includes programs for Mexico and ones designed for travel by car.